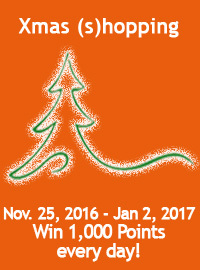 Win 1.000 Bouns Points every day! Between Nov 25, 2016 and Jan 2, 2016 all cardholders will automatically participate on our daily prize draw of 1.000 Bonus Points for the specific day their Bonus Card has been used. All cards of the Go Friends network, incl. Partner Cards are eligible to win. Each card transaction - regardless of amount, collection or redemption - counts as one entry to win the daily draw. Have fun with Go Friends Xmas (s)hopping and good luck.